GiLoCatur just received a HOT chess tournament details a couple of hours ago from "Sir" CM Collin Madhavan. (TQ Sir Collin!) 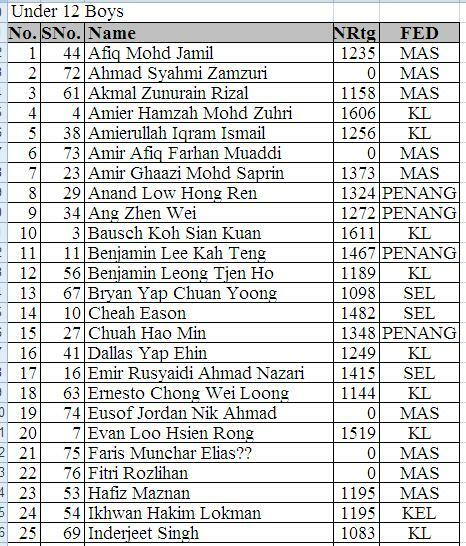 It is a very good news to the Malaysian chess community. One more chess tournament! 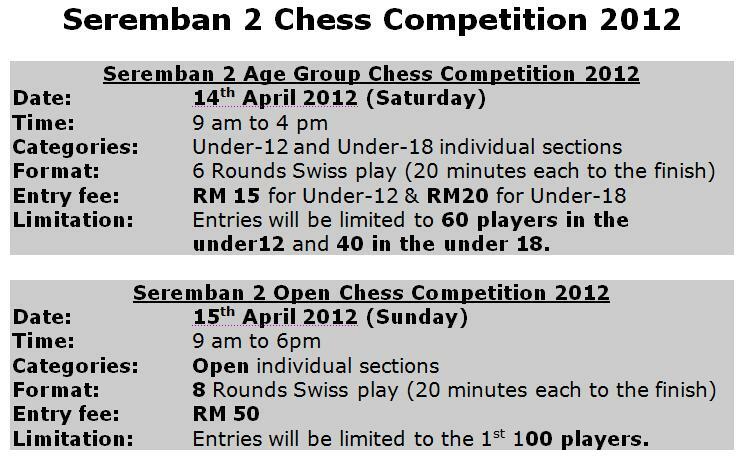 To the Malaysian chess players, show your gratitude by participating in these two chess tournaments! Why GiLoCatur says it is a HOT tournament? Because it offers money prizes of more than FIVE THOUSANDS Malaysian Ringgit. BUT, seats are limited. For adult chess players, it shouldn't be a dilemma on Saturday, 14th April, two weeks from now. But for chess parents like GiLoCatur, it will be a dilemma. Which following chess tournament to go? 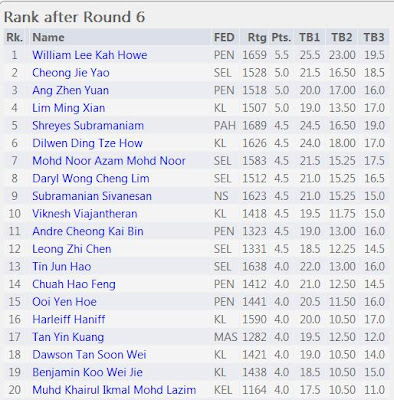 What an APRIL treat for Malaysian chess! The month in which GiLoCatur was born. Yesterday, GiLoCatur took part in the Insofar Combined chess tournament the month of March edition. GiLoCatur and the kids did not participate in both the January and February edition. The March edition had attracted more participants than its previous two editions. 134 players took part in the 7-round 25-minute-per player chess tournament compared to 120. GiLoCatur does not have the official results yet. GiLoCatur and family left early missing the closing and prize giving ceremony. Who emerged champion in this month edition? The previous edition champions - Sumant (January) and AM Fadzil Nayan (February) also took part yesterday. Click here for Insofar January edition results and here for Insofar February edition results. Based on below Round 7 pairings, can you guess who is the champion and other Top 10 winners? 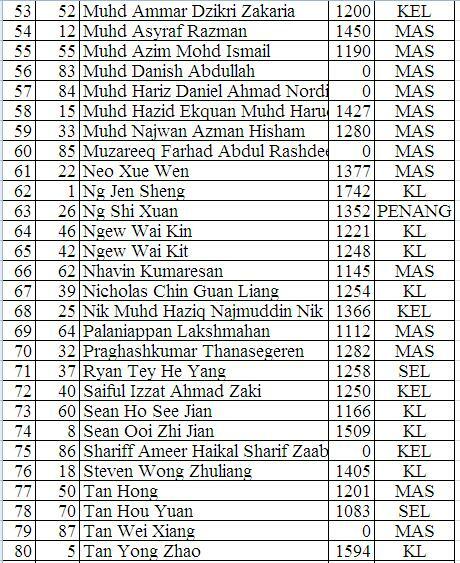 Both Li Tian and Syazwan are among the top 10 seed. The former is first with national rating 2084 while the latter is seventh with national rating of 1895. How about Yusop and Alfirdaus? Yusop who is GiLoCatur's first round opponent is unrated and is seeded 140th. 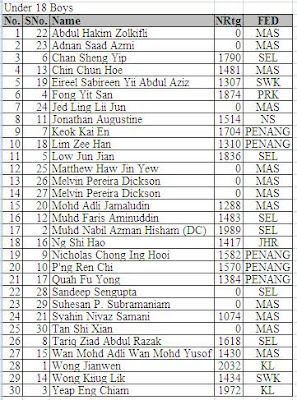 While Alfirdaus, an IPT student GiLoCatur believes, is the 57th seed with national rating of 1460. Surely, the most appropriate and minimum number of rounds for the total of 134 number of participants is eight (8). But the first round started about 15 minutes to 11 o'clock. Fortunately, with the efficiency and quickness of Najib Wahab as the pairing manager the tournament could be completed by six thirty (6.30pm). Importantly, the time control was not reduced. It was 25-minute-per-player for all the seven rounds. Bravo and kudos to Mr Zaki Yeop of Insofar, Najib Wahab and all including both the players and their parents who made the event memorable. Below are several pictures of the tournament for all to see. It is 25th March 2012 today. It is Fahim's 10th birthday. HAPPY 10th BIRTHDAY TO MY DEAREST YOUNGEST SON! MAY ALLAH BLESS YOU ALWAYS. It is already past the mid of March 2012. Twelve more days to go before the month of March in the year of 2012 leave us. The first school midterm break is just over. So is NAG 2012. Next Sunday will be 25th March. It is an important date for GiLoCatur's family especially to Fahim. It will be his 10th birthday. Most probably, Fahim will celebrate his 10th birthday by playing in the Insofar March Combined Tournament. Hopefully, his elder brother and sister can participate too. In fact, GiLoCatur is planning to partiicpate too. It is a nationally-rated event. 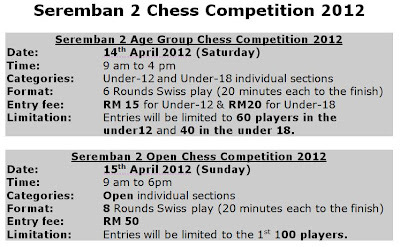 So, as a reminder to all the Malaysian chess community, below are the summarized info of the tournament. Click here to view the photo gallery of the previous Insofar Combined chess tournament recorded Ng6. At the time of this entry, the Round 7 results and the Round 8 pairings for two categories - U8 and U10 Girls, had been published at chess-results.com. In U8 Girls, Goh Jie Yi the defending champion is certain to be the champion. She is leading with one full point. In the final round, she is paired with Siti Nur Haziqah Mohd Haslam. The first runner up looks also certain to be won by Zainoor Ikmal Munirah. She has 6/7 points. She will play black against Eunice Tang En Shi. The third and fourth placing are still in the race. In U10 Girls, the top three placing are almost in the hand of the current ranking provided they win their respective final round. 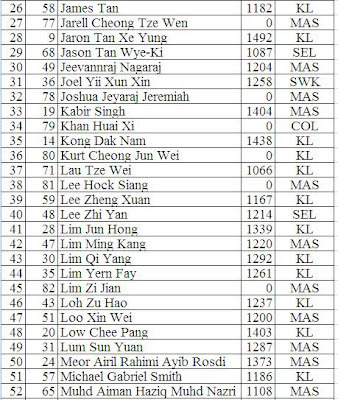 Leading the pack is Chua Jia-Tien with 6.5/7 points followed by Nurul Farhana Halim with 6/7 points. In the third place is Zainoor Ikmal Maisarah scoring 5/7 points. In U8 Boys, the top seed Lye Lik Zang from KL won all his seven rounds to become the leader in this age group category. GiLoCatur has no doubt that he will emerge as the champion. 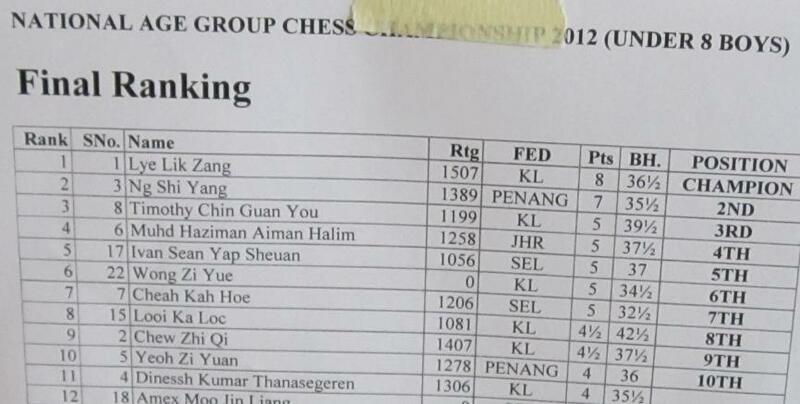 In the final round, he will be challenged by Chew Zhi Qi at the top board. In second place is Ng Shi Yang who only lost once to the top seed in the fourth round. Under 14 Boys is quite tough and unpredictable. GiLoCatur notices that many of them are MSS district or/and state players. GiLoCatur hopes that most of them continue to be active in the local chess scene and try to improve their chess level and rating. None of them has rating above 1700. They should learn and practice more and participate in many chess tournaments including the rated ones. They should break the 1700 and 1800 national rating. 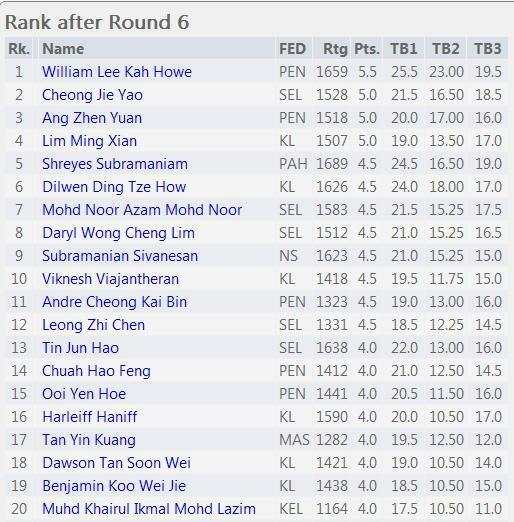 William Lee Kah Howe of Penang is the sole leader with 5.5/6 points. He beat the top seed in the sixth round. He will become the champion in this age group provided that he wins his final two rounds. He is paired against Ang Zhen Yuan in the 7th round. Can he handle the pressure to be at the top board? The players in the Under 16 Girls age group category play in the round robin format. This is because the number of participants in this category is only eight (8). The final round will be held at 12.30pm on the third and final day of tournament. 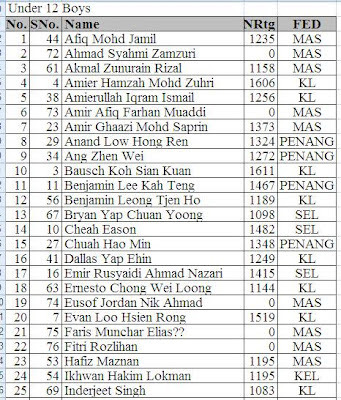 Nur Nabila is currently the leader in the age group with one full point ahead of the other participants. GiLoCatur strongly believes that she will win her seventh round and emerge as the champion. And the first runner up should be won by Hoh Tjin Hui of Penang. Three players in the Under 18 Boys age group category have the full 3/3 points. Wong Jianwen is leading the pack. Jonathan Augustine is the giant killer in the first day. 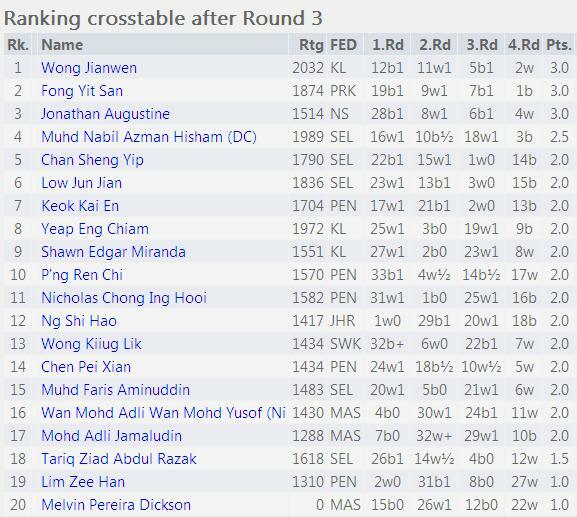 He defeated higher-rated Eng Chiam of KL and Jun Jian of Selangor. 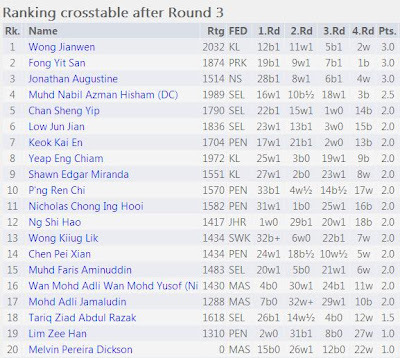 It will be an interesting Round 4 matches between Jianwen and Yit San on the top board. Who will emerge winner? OR will their match end up draw? And it is also an interesting match at the second board. Can Jonathan continue his giant killing act when he is paired against one of the favourites, Muhd Nabil? In the U8 Boys age group category, the top seed Lye Lik Zang from KL is on his way to become the champion. In Round 4, he will be challenged by Ng Shi Yang. Will Lik Zang continue his winning streak? OR will Shi Yang stop him? In Under 8 Girls category, two players are leading the pack after Round 3. 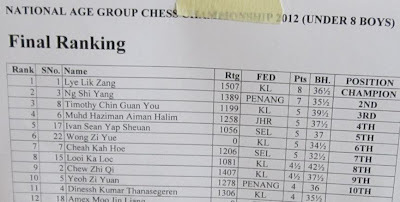 Goh Jie Yi, the defending champion from Penang, will face with Zainoor Ikmal Munirah from Selangor in the fourth round. Both of them have the full 3/3 points. Who will win? OR would the match be a draw? The first day of NAG or Malaysian National Age Group was over. Three rounds had completed. GiLoCatur is so tired that GiLoCatur just woke up from a three-hour sleep after having dinner and Maghrib prayer. GiLoCatur and the children arrived at the tournament hall at around 10.00am. GiLoCatur was a bit surprised to find out that the perimeter of the tournament hall was packed and crowded with more than 400 participants and their parents as you can see at the following photo gallery. GiLoCatur is happy with the seating arrangement. It is comfortable and nicely organized; NOT cramped and crowded. Both players and parents were so eager to enter the tournament hall. After checking the pairings the players could not wait to sit at their tables to begin their 2012 NAG chess competition. While taking the above picture, GiLoCatur and the children were at the upper level. We waited for a while before checking the pairings. The above three pictures show both players and parents were looking at the board numbers. Thumbs up to the organizing committee for putting up the age group section or location. The parents at the upper level watching over the tournament hall observing the players as well as some parents getting into their board tables. Some of them are new while some others have attended chess competitions before. 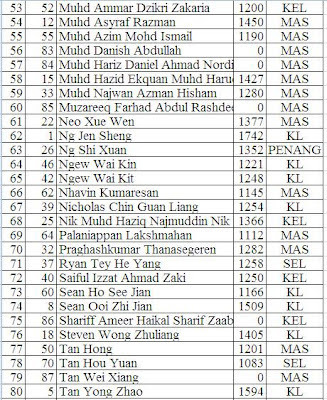 30 participants had registered in the Under 18 Boys age group category. Wong Jianwen from KL is the top seed. Nabil Azman Hisham is the second seed. 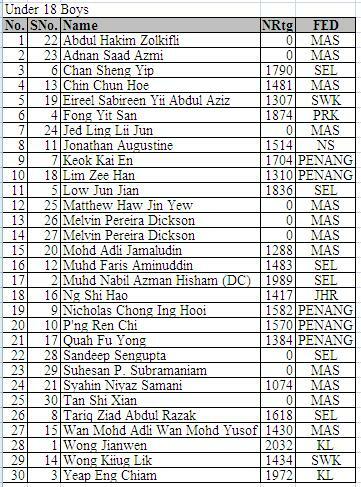 Yeap Eng Chiam from KL and Fong Yit San from Perak are the third and fourth seed respectively. Syakir Shazmeer from Selangor does not participate. 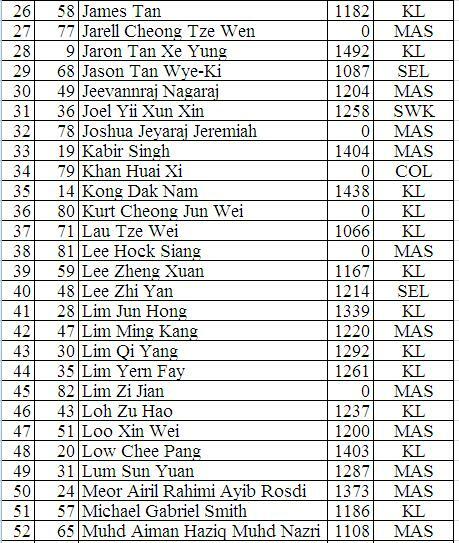 His MSSM Selangor team mate Low Jun Jian is the fifth seed. It will be an interesting fight for the title. It will be the last NAG for the MSSM Selangor players - Nabil, Jun Jian, Sheng Yip and Tariq Ziad. 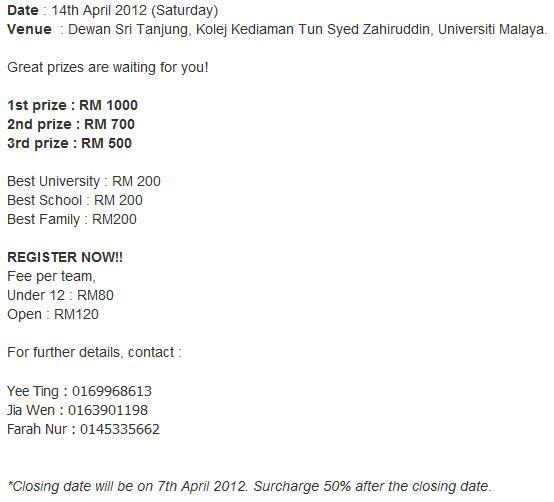 Good luck to all the participants. Under 12 Boys is the highest age group category in the 2012 NAG. It had attracted 87 players aged 11 and 12 years old. Will Selangor Open Stop At The 38th Edition?